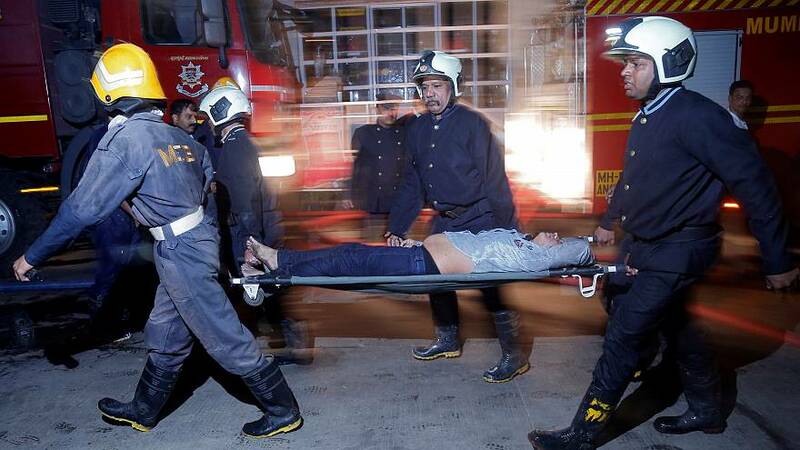 Fire swept through a rooftop restaurant in Mumbai early on Friday, leaving at least 14 people dead. The blaze happened in a major nightlife district of India's financial hub, at a complex also housing media outlets. Most of the dead were women attending a birthday party. "People came here to drink," said Sharad Jadhav‎, a producer at the TV9 Marathi Channel. "When the injured ladies were coming down, we could see that they were burnt from one side, their hands were burnt." A fake bamboo ceiling in the restaurant reportedly collapsed, trapping people trying to escape the blaze. Flames are said to have engulfed the whole building in less than 30 minutes. Police and family confirmed the woman celebrating her 28th birthday was among the dead. Dozens of people were taken to hospital. Why the fire started after midnight is under investigation. Police are said to be focussing their inquiries on the proprietors of the '1 Above' restaurant, where the inferno is said to have begun. Prime Minister Narendra Modi expressed his condolences. "Anguished by the fire in Mumbai. My thoughts are with the bereaved families in this hour of grief. I pray that those injured recover quickly," the PM's Office tweeted. The Kamala Mills district where the blaze occurred is home to several corporate offices and high-end pubs and restaurants opening up in recent years.